I’m kicking off my 2017 Christmas Gift Guide with everybody’s favourite… Stocking Stuffers and cool Gifts Under R100! 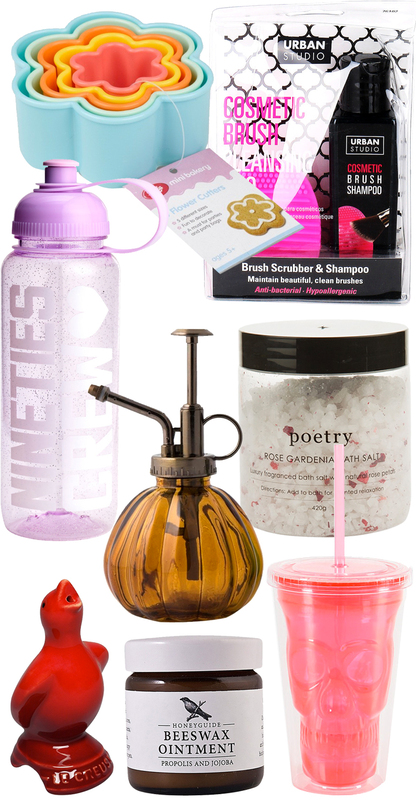 Yep, you can find pretty cool, budget friendly stuff if you just spend some time looking around, so I’ve saved you the trouble by searching high and low for the very best gifts under R100! If you gave me any of these as gifts, I’d be smiling ear to ear! They are not only super affordable, but they will make the person receiving them smile! Definitely better than getting socks! Although, I must admit, I do have a thing for socks; and if I got festive socks under the tree, I wouldn’t be disappointed to say the least. But anyhoo, I’ve tried to find gifts that will speak to the unique personalities of your friends and family. If she’s into baking, the Mini Flower Cutters or the Le Creuset Pie Bird would be winners. Makeup girls will love the Urban Studio Cosmetic Brush Cleansing Duo… I bought one of these for myself and a couple of friends already, and it is pretty awesome and works really well at cleaning your makeup brushes. I haven’t forgotten about the guys either and I know he will love these gifts and prefer them over socks or another tie. If he’s a bearded man, he’ll love the Beard Boys Brush, if he’s into building stuff, the DIY Deer Head is really cool and if he’s into his gadgets, the Batman Styled Fidget Spinner is a great gift. With my stocking stuffers out of the way, remember to stay tuned for more Gift Guides coming up before Christmas. I’ve got some really beautiful gift ideas that I am sure you will love!